Roasting coffee is a traditional craft and decisive for the taste of the coffee. Roasting masters create a separate roasting profile for each coffee which emphasises the individual character of the coffee. A coffee bean consists of approximately 300,000 to 400,000 cells. Very complex chemical reactions take place during roasting as heat is applied. While roasting, an estimated 1,000 new flavours or chemical compounds are formed in each individual cell, making coffee one of the most aromatic foods on earth with significantly more flavours than wine. 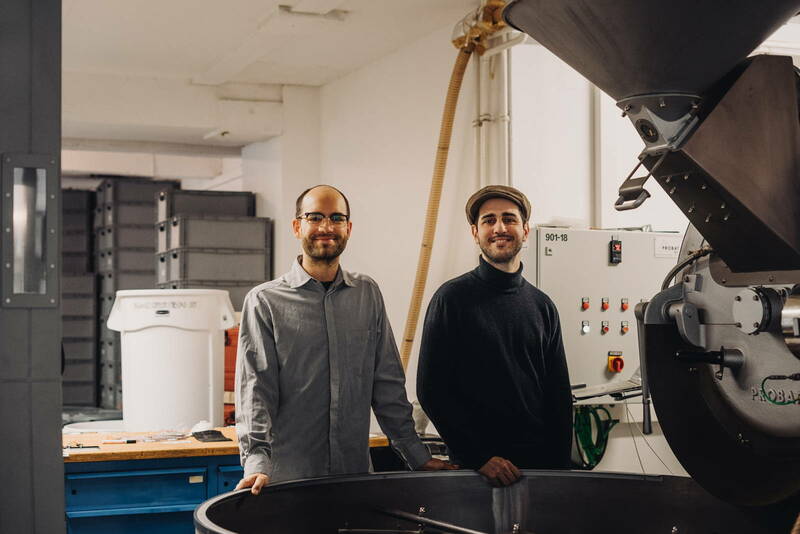 We roast our coffees in our coffee roasting plant in the district of Wedding in Berlin in the traditional Probat drum roaster. This allows for the full unfolding of coffee flavours. 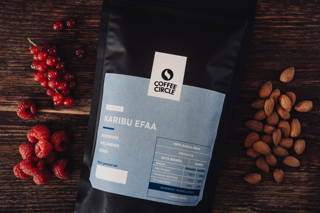 Our coffees are roasted in batches of 40 to 60 kg with roasting times varying between 12 and 19 minutes with roasting times depending on the desired outcome. The final temperatures range from 200°C for light filter coffee roasts to 220°C for our Italian Roast Grano Gayo. Roasting plays a decisive role in the quality of coffee. 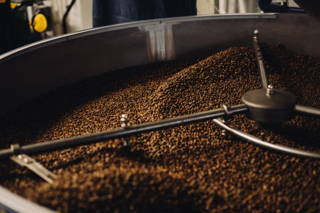 The energy required for roasting is indirectly supplied to the coffee by contact with the externally heated roasting drum and the heated air. After the roasting process has been completed, the coffee must be cooled down quickly. This takes place with a cold-air supply on cooling screens and entirely without water. The weight loss of coffee caused by the loss of water in the beans and by chemical transformation processes (also called burn-in) can amount to up to 18% in this traditional process.We roast our coffees over a longer period of time and at comparatively low heat so flavour flavours can develop to full advantage. Only the desired, fine fruit acids that contribute to the character of our coffee are preserved. We roast our espressos a little longer than our filter coffees. In this way unwanted acids disappear almost completely and give way to the strong taste typical of espresso. Overall, the drum roasting process is a complex and demanding process that most effectively breaks down the aggressive chlorogenic acids that irritate the stomach wall. The initially pale green and hay-smelling green coffee is put into the preheated roaster. The heat dries the remaining moisture out of the beans and the colour of the beans gradually turns yellow. After about 7 to 10 minutes, the colour changes to brown, giving off a scent reminiscent of popcorn or freshly baked bread. The new gases produced in the beans (carbon dioxide and monoxide) significantly increase the volume of the beans. After about 12 to 15 minutes, the pressure in the beans is so high that cell walls of the coffee bean can be heart bursting. This moment is called first crack. From this point on, the entire spectrum of taste diversity unfolds. The fruit acids are broken down, sugar is caramelised and the cell structure is weakened. During this time the roasting master must be on top of the process because there only has 2 to 4 minutes left until the beans are charred. 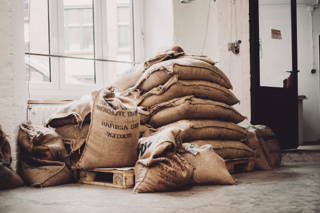 During this time, the colour of roasted coffee changes from light brown to medium brown, then dark brown to black brown. 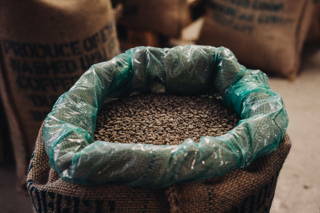 Once the roasting process is complete, the coffee falls from the roasting drum into the cooling sieve. Here the hot coffee is cooled by cold air and an agitator. 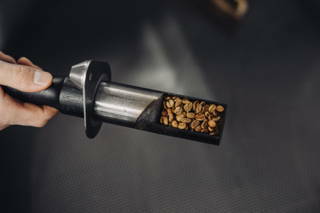 The beans then pass through a de-stoner, where small stones which are sometimes present in the green coffee are separated. The roasted coffee is then packed and left for a few more days to gas out. Once it has passed a „rest period“ of about five to ten days is full aroma achieved. 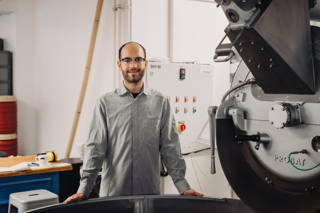 Hannes joined Coffee Circle in 2012. He’s always been interested in the various influences on coffee such as the material of the drum roaster or the degree of heat. Hannes‘ opinion is that you have to try a lot in your search for a good roast. That’s what makes this job so unique. 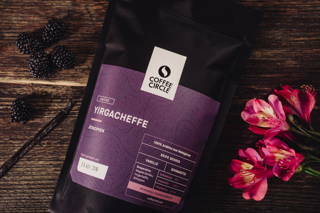 His favourite drink is our Yirgacheffe – a classic that has opened his eyes with its floral notes. 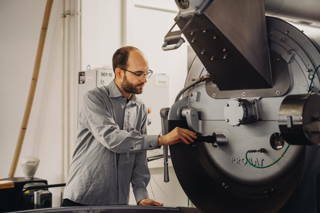 Ersin has been in our roastery since October 2016. Previously he worked in marketing, led barista training sessions and developed an interest in roasting coffee. The different aromas of coffee, influenced by climate and roasting, fascinate him every day. For him, sweetness, complexity and cleanliness of the bean are the most important quality characteristics. He sees these best united in the Karani – his current darling. Robert joined Coffee Circle in October 2016. 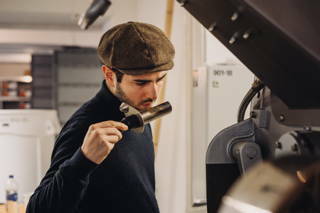 As a trained chemical-technical assistant, he is particularly interested in the complex processes that take place in the coffee bean during the roasting process. He is of the opinion that one can roast better with a greater understanding of this. He currently prefers the Yirgacheffe, but actually likes to drink all kinds, because all coffees have been roasted with special care. The art of the roasting master is to take control the heat supply of the roasting machine and thereby develop an optimal aroma, and gently extract out the best from a green coffee. As soon as we’ve developed an optimal „roasting curve“ for each coffee, the roasting machine technology helps us constantly reproduce this profile. During the roasting process, differences in roasting time of just a few seconds or minimal temperature deviations during the roasting process can lead to differences in taste. 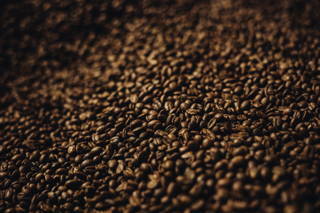 With increasing roasting time the acids are broken down and the roasting aromas increase. The longer the coffee is roasted, the stronger and more bitter it becomes. The coffee’s own taste increasingly falls into the background. Depending on the purpose for which the beans are roasted, the roasting degree and the final temperature are determined by the roasting master. When roasting espresso beans, a strong taste with a low acidity should usually be produced, which is why espressos tend to be roasted longer. In filter coffee a slight acid content contributes to the liveliness of the taste, which is why it’s roasted for less time. With most of our „Limited Edition“ coffees, which are characterised by their light roasting, the roasting master finishes the roasting process shortly after the first crack. In Scandinavia, for example, this type of roasting is very widespread. If you drink a filter coffee there, it probably reminds you more of a cup of tea than traditional coffee. If you visit a café in Italy, however, you will find strong roast aromas and a bitter taste in your cup because Italians prefer a dark roast, comparable to our Grano Gayo coffee. 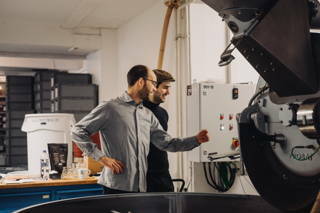 What are the advantages of self-roasting for Coffee Circle and its customers? We can produce even fresher coffee with significantly better, more consistent coffee quality and better quality control. The proximity to our logistics chain makes many things easier and faster. We are independent, so we can experiment more and offer a changing coffee portfolio. 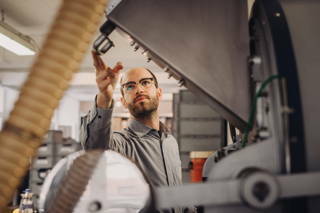 Has anything changed in the way you work, if so – what? Yes, I spend most of my working time directly in the roasting plant, either at the roaster or at the cupping table, to check the quality of our coffee. 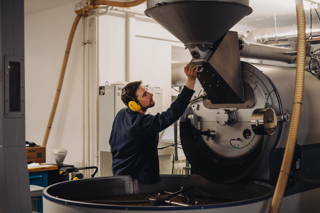 As we are now a real coffee production facility, we have hired more staff in the roasting plant, which mainly helps with roasting and packaging. This also increases the organizational demands. I am very happy that we have found an excellent second roasting master in our new colleague Ersin. What’s going really well? Where do you see room for improvement? I am very satisfied with the consistency of our coffee quality. Our new roasting machine works very accurately. Every single roasting recipe we have developed is surprisingly easy to reproduce thanks to its semi-automatic functionality. I see room for improvement in the filling process, where a lot of manual work is still required at the moment. What else can you tell us about the roasting machine? The roasting machine is called Probaten P60, and comes from the house of the world market leader Probat and holds up to 60 kg of green coffee. The special feature is that the material of the roasting drum is cast iron, which gives the coffee a very special flavour and a fuller body. The roasting time is between 11 and 18 minutes. How would you describe the road to your own roastery in three words?